Separators are used to remove entrained water from air or steam as it is transported. Various types are available, ranging from models with integral traps to compact stainless steel models. TLV Cyclone Separators all support inline installation. Cyclone Separators for steam with built-in Free Float® steam trap. Cyclone Separators for air with built-in air trap. Cyclone Separators of all stainless steel welded construction without the built-in steam trap. Separators forcibly separate out water (condensate) that is entrained in the flow of steam or air. TLV Cyclone Separators achieve a remarkably high separation efficiency of 98%. 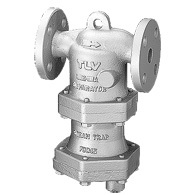 The integral Free Float® steam trap discharges continuously and features three-point seating for a tight seal. Separators help to ensure high-quality steam or air free of condensate, increasing productivity and product quality. Steam main lines, equipment that uses direct contact with live steam, etc. Air piping, processes requiring dry air.